If you know me, then you know that I’m all about living into your own Divinity to make your life—and your business—flow. One of my favorite tools for supporting myself energetically—and by that I mean, to help give me the energy I need to move forward when I don’t have it within me at the moment, for whatever reason—is crystal energy. If you’re reading this, you’re a friend of the woo—you wouldn’t have gotten 30 seconds into my homepage if you weren’t! 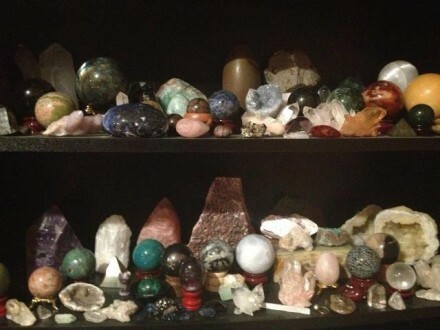 Still, I find that lots of woo-friends have not yet awakened to the power and generosity of crystals. If you fall into that camp, never fear: we’re gonna set you straight right now. Crystals have been used since ancient times for their power: power to heal, power to direct energy and intentions. And today they’re used all over the place for their power to power things. As an entrepreneur, you can get in on that action! Incidentally, the most abundant thing at or under the surface of the Earth is quartz: 70% of what’s under our feet is Silicon Dioxide, some form of quartz. And of course it’s this mineral that gave Silicon Valley its moniker: quartz crystal powers just about every piece of technology out there. And yes, I did say generosity: crystals give and give and ask for nothing in return. Quartzes, for example, are piezo- and pyro-electric. That means that they produce electricity when compressed or heated. (This is why quartz watches never need winding.) Perpetual-energy “machines” are pretty amazing, really, especially when they’re not machines at all, but occur spontaneously in nature, right? Even though not all crystals are members of the quartz family, all crystals do contain and emanate a specific frequency of energy. AND they are great for the entrepreneur who needs an energetic boost in some area. And let’s be honest: who doesn’t need an energetic boost in some area? Do you want to bring more Love into your life–or keep the fear at bay? Try Rose Quartz. I’ve got a gorgeous Rose Quartz ring that took me from the brink of divorce to marital happiness in a matter of WEEKS when things like couples’ therapy had failed. Wow: it’s my conversion piece. Do you want more clarity? Try Clear Quartz. More luck? Green Aventurine. Is EMF pollution from wi-fi and other technologies you use in your work getting you down or making you sick? Black Tourmaline will put you back on track. Sick of stewing in negativity? Citrine will not only transmute those bad vibes to joy and Light, but it’s also a great manifesting stone. Citrine is the stone of Abundance, and one of my personal faves, especially for the entrepreneur. It’s traditionally known as the “Merchant’s Stone” because of its legendary ability to bring in customers and cash. Do you need more energy or oomph to do those things that need to be done? Carnelian will get you over the hump. More courage to take the risks you know need to be taken? Bloodstone’s for you. How about more insight or intuition? Try Sodalite, Azurite, or Fluorite. Need to strengthen your connection to the Divine, and get a grounding and detoxing boost while you’re at it? Amethyst will do the trick. Do you have a workshop or speaking event coming up and you’re worried you’ll have stage-fright? Try Blue Lace Agate. Need to connect more to your Higher Self to co-create your business? Selenite’s for you, and it will also clear and recharge all of your other crystals in record time—it’s one of my very favorites. Garnet is great for the entrepreneur. It carries the energy of prosperity and reminds you that you have everything you need, and that scarcity is an illusion. Need more willpower? Malachite will set you up. Are you struggling or resisting something? Tourmaline’s energy will help you to accept and surrender. And that’s just the beginning. Seriously, I attribute a large part of my serenity, trust, and business success to the crystals I surround myself with and wear every day. I consider them not just helpers, but also dear friends who want the best for me. And you can learn to use them too. I hope the above list has given you some good ideas or sparked your curiosity about how you could use these unobtrusive and generous energy-fixers in your business. There’s plenty to start with right here, but if you want to get into the nitty-gritty, there’s still time to join the crystal discussion in the Shine Your Light program. Our next class is next Wednesday, though, and I’ll want to get your pouch of chakra stones from my personal collection in the mail to you right away so you can play along with the rest of us. So let me know right away if you want to explore if this is right for you. One final note about crystals: you agree that water, when it freezes, form ice, frost, or snow crystals, right? That makes water a liquid crystal. Well, the human body is made up of about 65% water. That makes each one of us walking, talking crystals. Ponder that one….